Currently available in Japan and soon to be released internationally is the GPW-1000V-1A “vintage” edition with an aged black ion plating treatment. We’ve seen this look before with the vintage gold and black GPW-1000TBS Baselword special edition and the vintage black MTG-S1000V. This innovative aged IP treatment is a great look for metal surfaces and shows that G-Shock is as strongly committed to style as it is to technology. 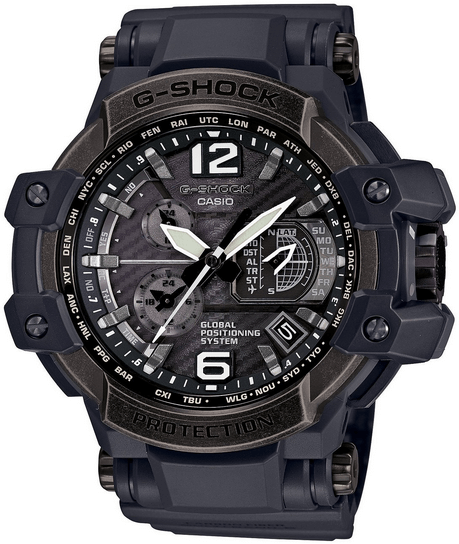 The all-analog GPW-1000 features GPS Hybrid Wave Ceptor timekeeping, Tough Solar, Triple G Resist, sapphire crystal, and a carbon fiber insert band. So this one has no triple sensors? No Triple Sensor, main features are Tough Solar, GPS Hybrid Wave Ceptor timekeeping, and Triple G Resist.